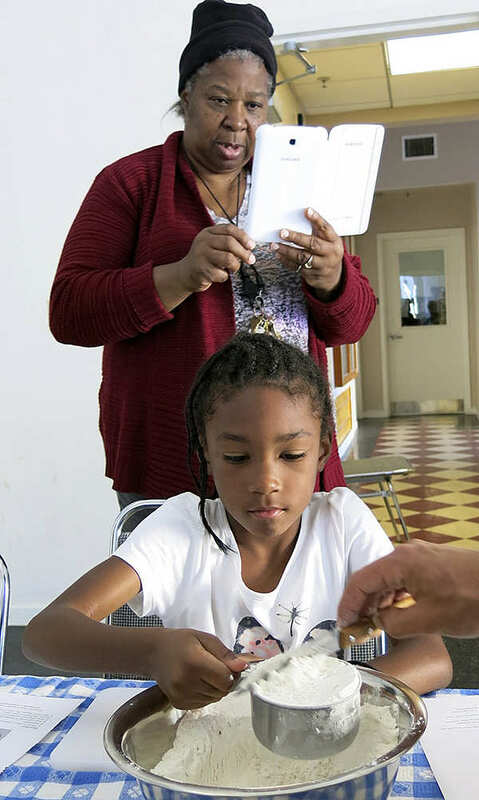 Crystal Jones, our new Seed-tp-Mouth Cooking Coordinator is already making a big impact at Willie Mays Clubhouse in the Bayview Hunters Point neighborhood. 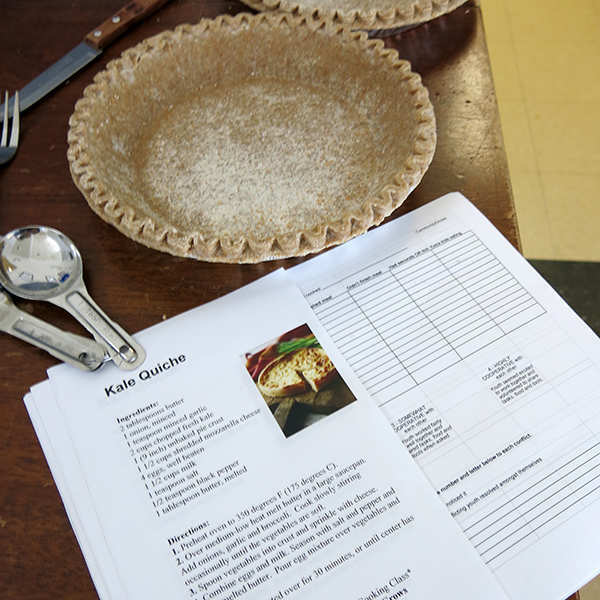 Here is Crystal’s report: The teens enjoyed making the Torilla Epanola recipe very much last week. 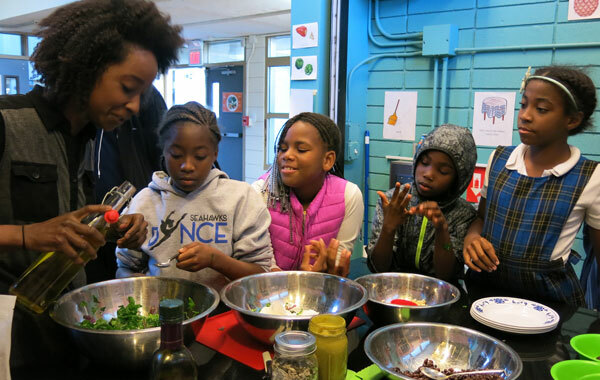 So much so that they ended up making another so everyone could have seconds, after they all finished off the first This recipe was made using kale from the Edible Schoolyard garden. 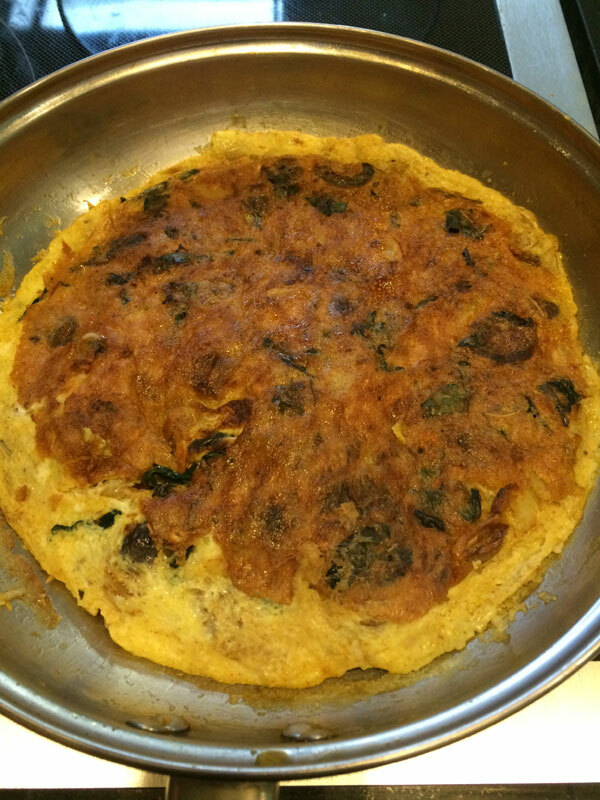 We discussed briefly, the differences between the American Omelette and the Spanish Omelette (Tortilla Epanola). 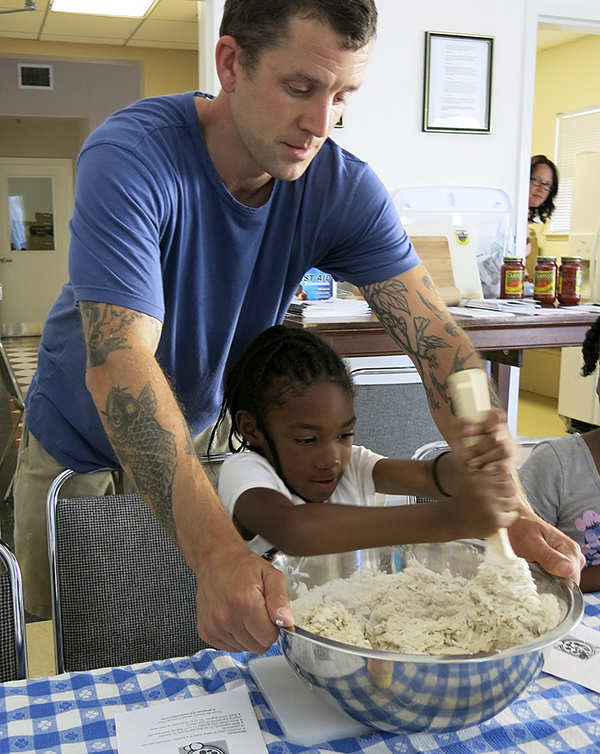 American omelettes are more blocks of scrambled egg, browned, and fortified with creams (the NY style), milk (Chicago style), butter or oils (Texas style), and baking powder (Portland style). Italian and Spanish omelettes are created by thoroughly heating egg mixtures until set. 1. Heat 2 teaspoons oil in a medium nonstick skillet over medium heat. Add onion and cook, stirring, until translucent, 3 to 4 minutes. Add potatoes, thyme and paprika and cook for 2 minutes more. 2. Lightly whisk eggs and egg whites in a large bowl. 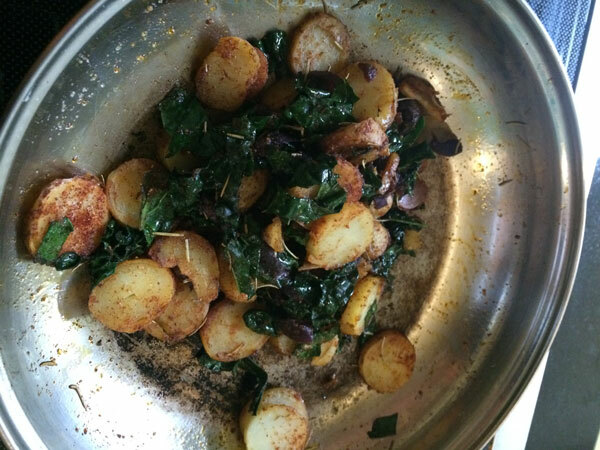 Gently stir the potato mixture into the eggs along with cheese, spinach, salt and pepper until combined. Wipe the pan clean; add the remaining 1 teaspoon oil and heat over medium heat. Pour in the egg mixture, cover and cook until the edges are set and the bottom is browned, 4 to 5 minutes (it will still be moist in the center). 3. To flip the tortilla, run a spatula gently around the edges to loosen them. 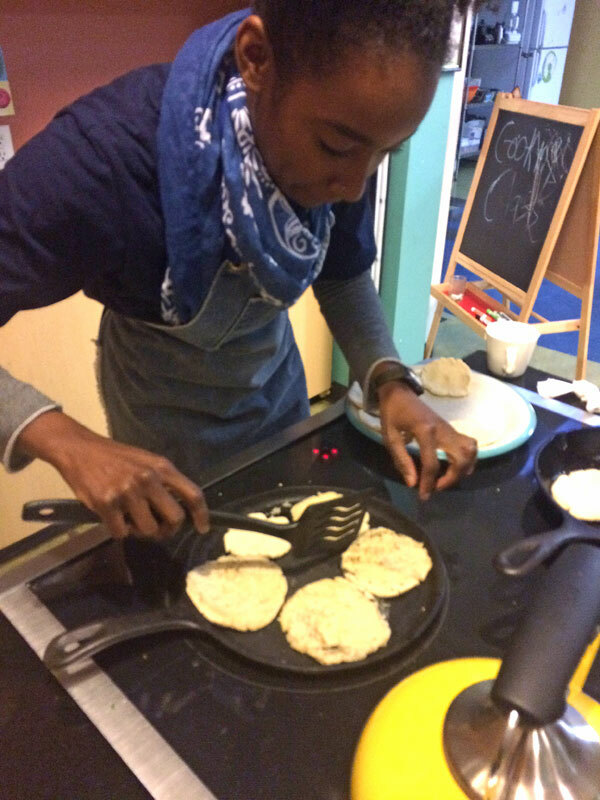 Invert a large plate over the pan and turn out the tortilla onto it. 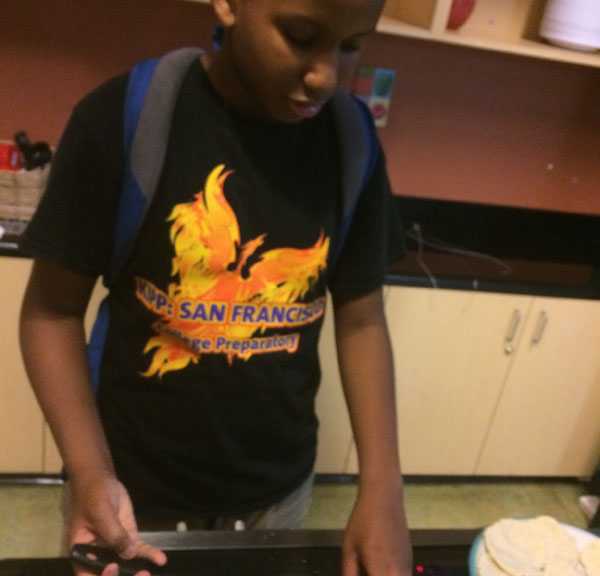 Slide the tortilla back into the pan and continue cooking until completely set in the middle, 3 to 6 minutes. Serve warm or cold. 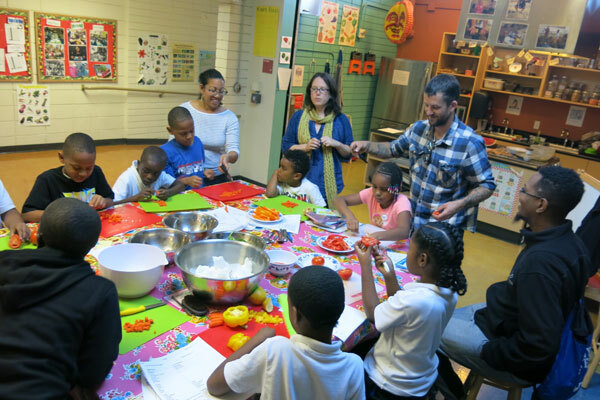 Later in the week youth from Willie Mays Clubhouse also make Arepas. 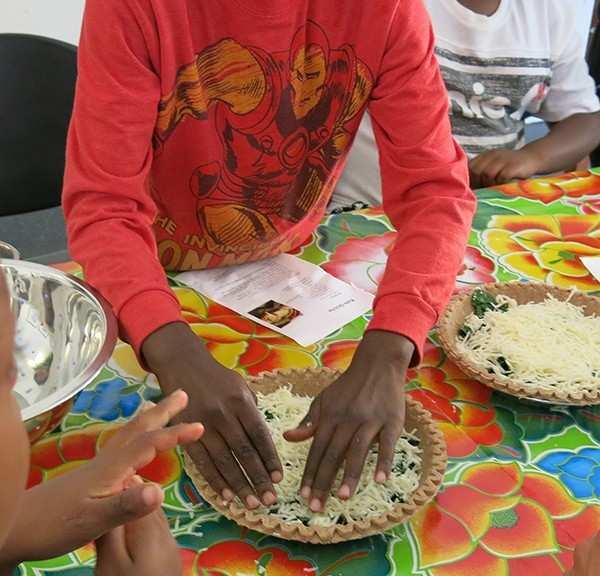 Arepa is a flatbread made of ground maize dough or cooked flour prominent in the cuisine of Columbia and Venezula. 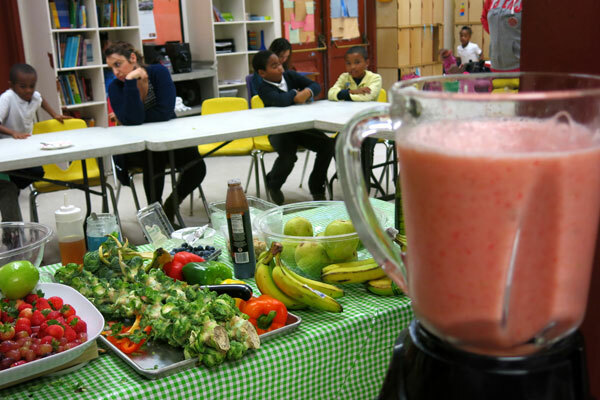 It is eaten daily in those countries and can be served with various accompaniments such as cheese (cuajada), avocado, or (especially in Venezuela) split and used to make sandwiches. Various sizes, maize types, and added ingredients are used to vary its preparation. It is similar in shape to the Mexican gordita and the Salavadorian pupusa. 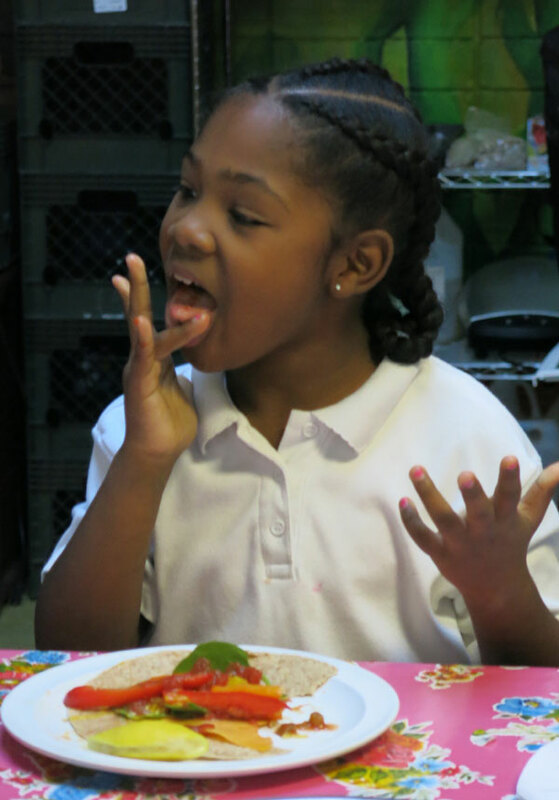 Arepas can also be found in Panama, Puerto Rico, the Dominican Republic, Trinidad and Tobago and the Canary Islands. Delicious! Thank you Crystal! For more photos from the day, check out our Flickr Photostream here. Staff: Do you want a little more kale? 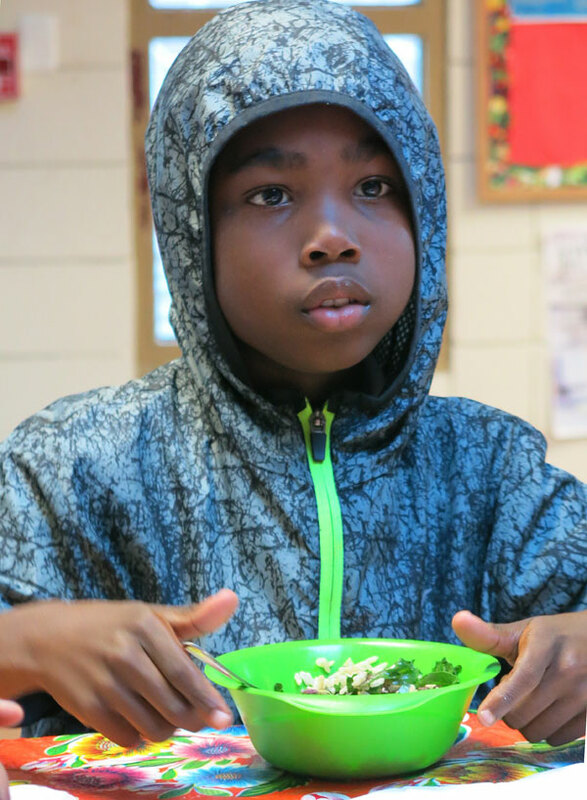 Staff: What do you like about kale? Yusef: It’s good! You can make a lot of things out of it, like kale chips and green dip. 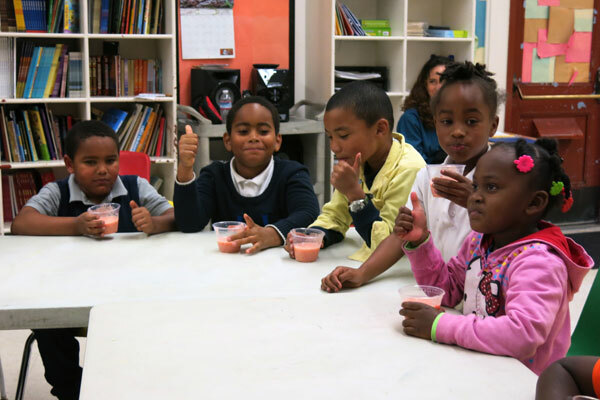 For more photos from the class, check out our Flickr Photostream here. 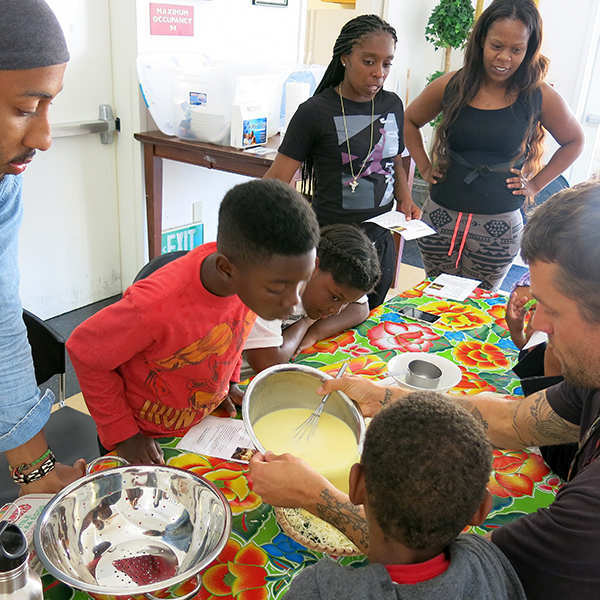 Hayward Rec Connect and the Buchanan YMCA kids were abuzz on Monday, November 16, 2015 with excitement to cook with Chef Chauncy Yarngo. 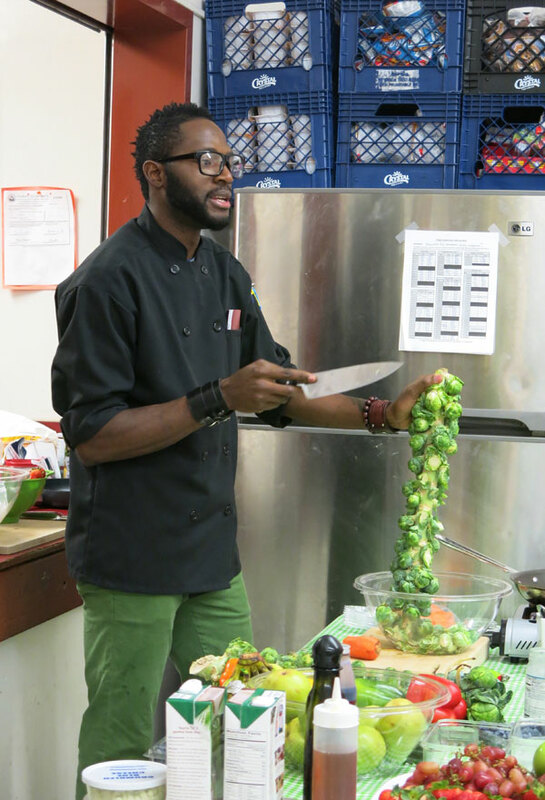 Chauncy Yarngo is from the Kpella tribe in Liberia who came to America at a younger age and has become a professional chef in the United States. 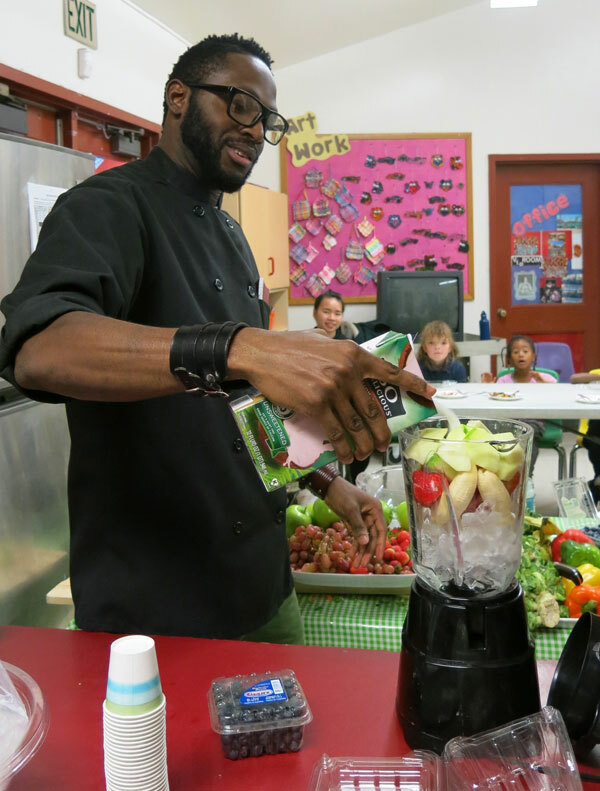 Chef Chauncy currently works part time at Facebook Headquarters and full-time with the 2nd largest catering company on the West Coast, Best Beverage Catering. 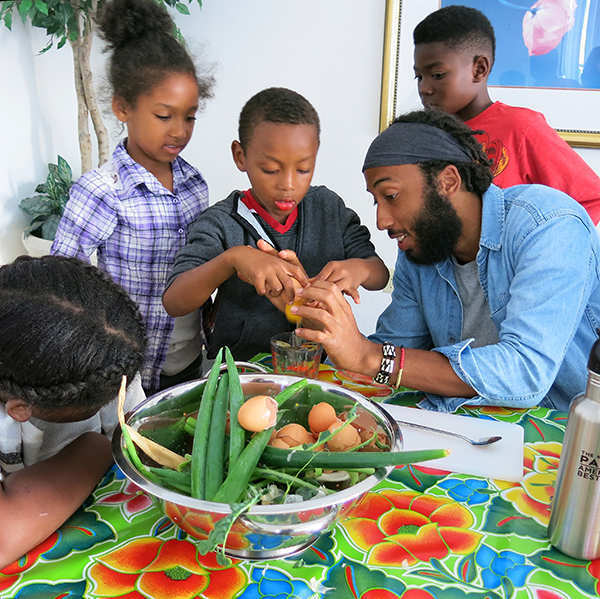 He will be taping a reality show called Bringing It to the Table on the Food Network soon. 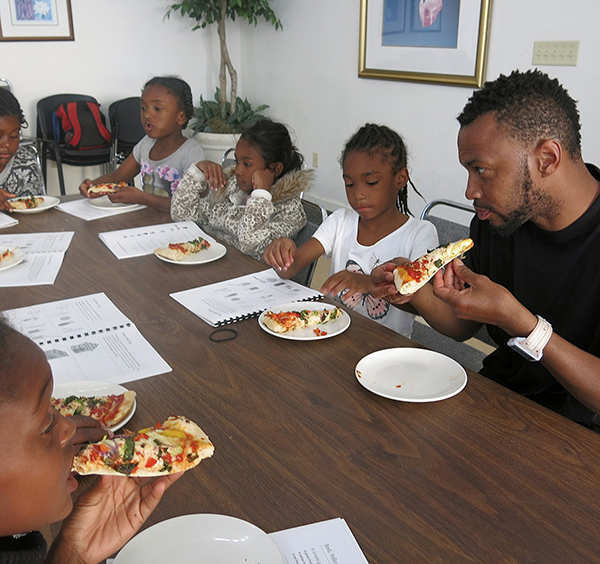 He has cooked for some famous people, including President Obama, Steph Curry, Danny Glover and Janet Jackson, to name a few. 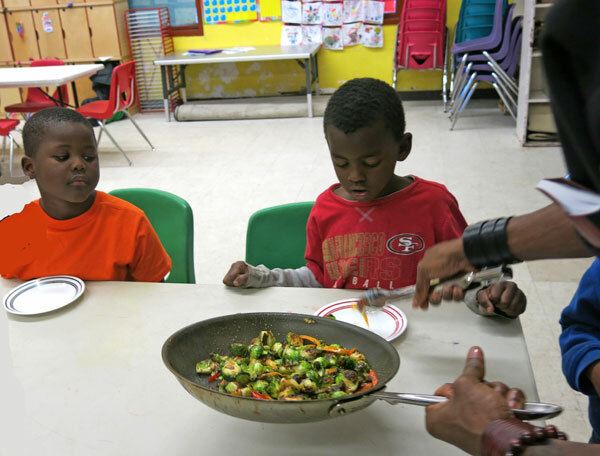 On Thursday, November 12, 2015 we did our first cooking class at Willie Mays Clubhouse at Hunters Point. 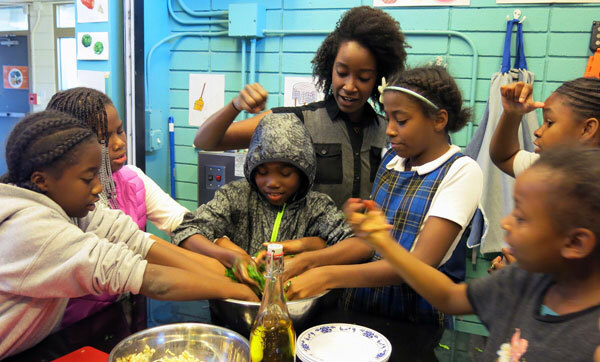 It was an honor to work in this kitchen, which is part of the first Edible Schoolyard Project built in San Francisco by Alice Waters in June 2008. 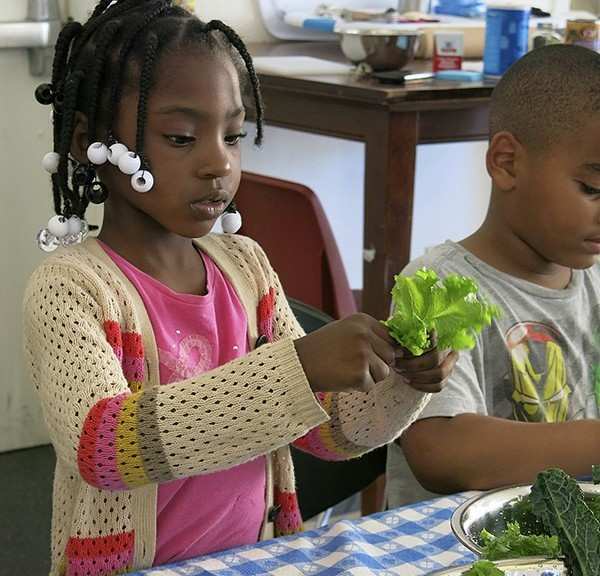 CommunityGrows will be offering cooking and gardening classes in the 2,000 square foot garden and well-appointed kitchen. 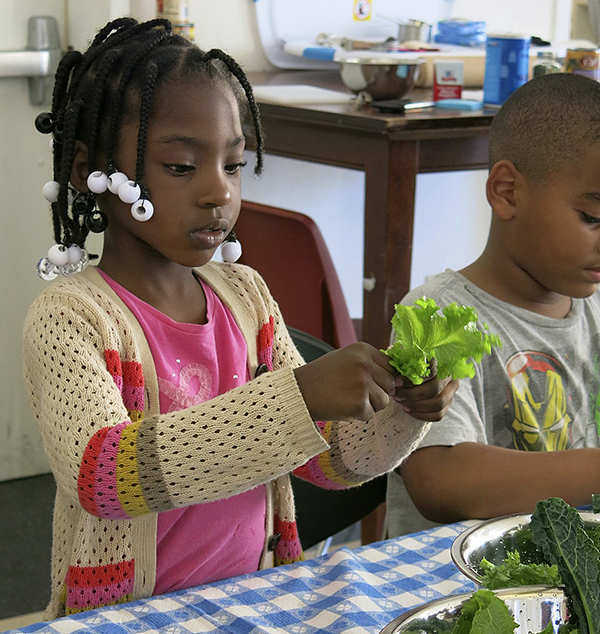 One of the main objectives of these programs is to involve youth in all aspects of tending the garden – along with preparing, serving and eating the food – as a way to increase access to fresh fruits and vegetables and develop lifelong healthy eating habits. 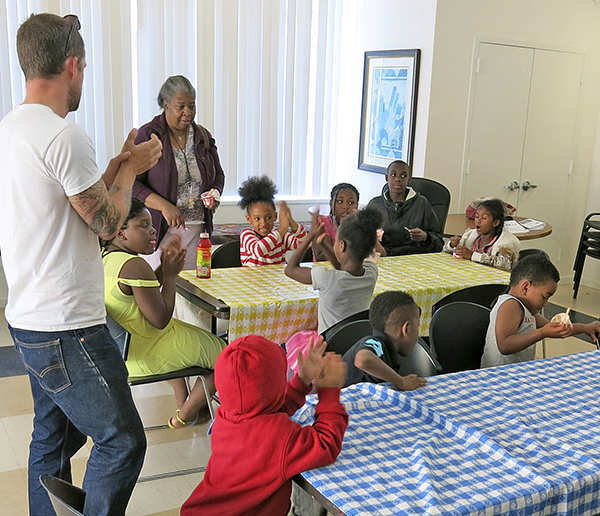 On this day Tavi Baker, MPH, the Citywide Director of Health and Fitness at the Boys & Gils Clubs of San Francisco joined us with Dominick Anthony, Education Director at Willie Mays Clubhouse. 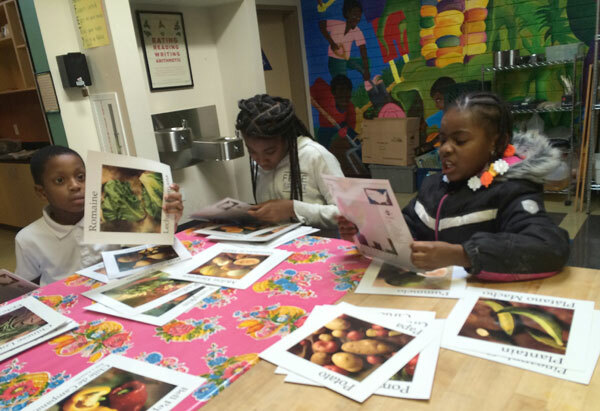 We were interviewing candidates for the Seed-to-Mouth Cooking Programs manager. 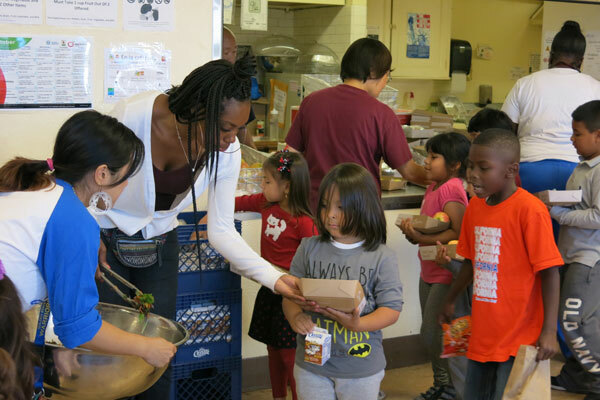 This new position will oversee our cooking programs in the Western Addition and Bayview-Hunters Point. 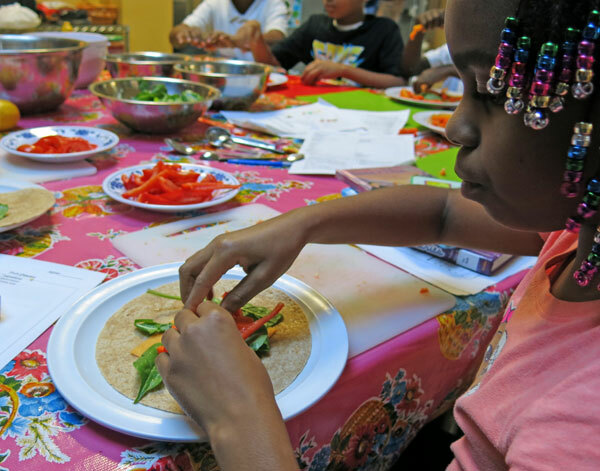 These photos are of the youth making veggie wraps. 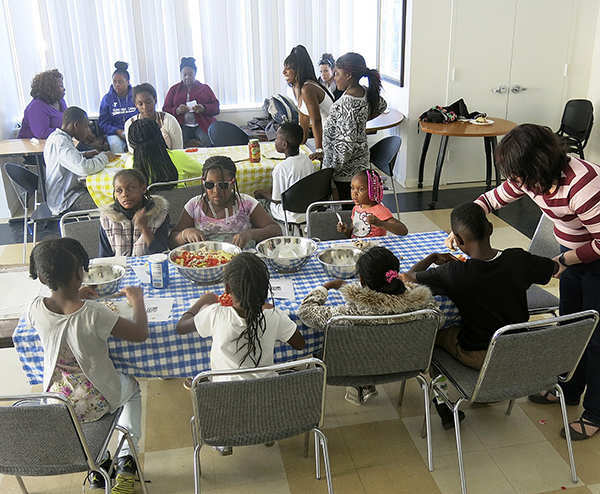 The Boys and Girls Club of San Francisco (BGCSF) started serving the Bayview-Hunters Point community in 2005 at the request of Mayor Gavin Newsom and City Attorney Dennis Herrera, who asked BGCSF to transform an old Housing Authority site into a safe haven for local youth. Their partnership has been critical in this historic project. Other key partners included the San Francisco 49ers and the San Francisco Giants, who built a Junior Giants Field on-site and later led the effort to rename the Club after the great Willie Mays. 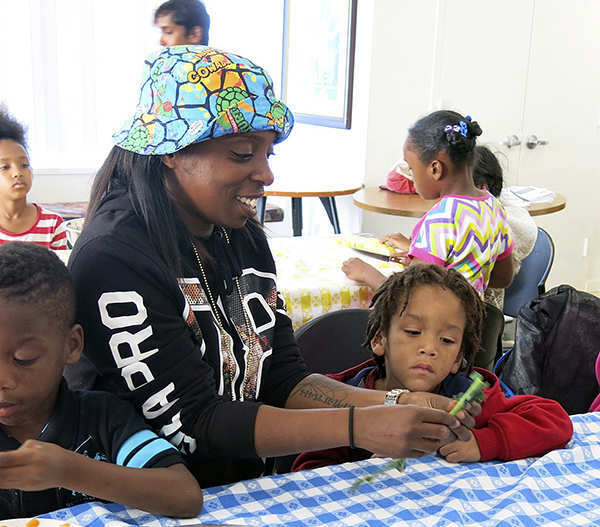 Now the Willie Mays Clubhouse provides full-service resources for 6 to 18-year-olds on Hunters Point Hill – a community that for decades had desperately lacked services for young people. 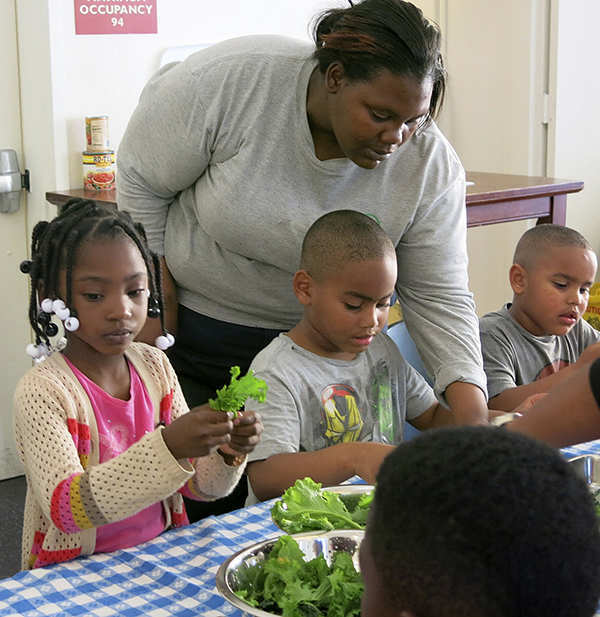 CommunityGrows is thrilled to be partnering with the Willie Mays Clubhouse at Hunters Point and thanks the Department of Children, Youth and Families for this opportunity. For more photos from the day, check out our Flickr Photostream here. 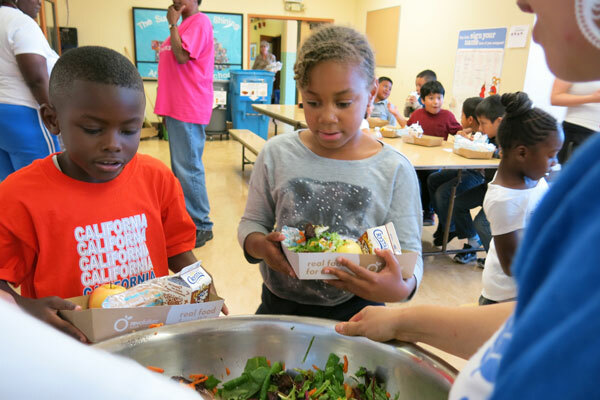 With a grant from Kaiser-Permanente we are honored to offer Salad Days again this year at John Muir Elementary School. 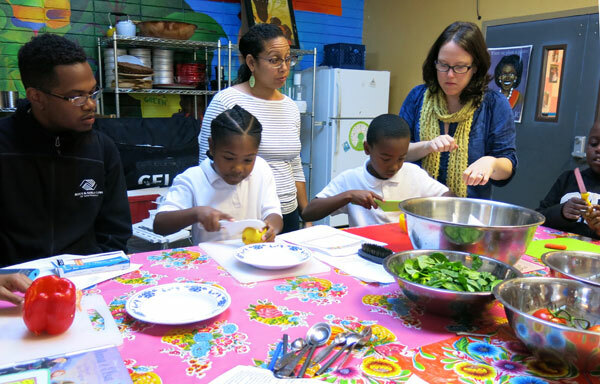 CommunityGrows staff Melissa Tang and Cha’Shay Woldridge joined Advisory Board member Casey Johnson in the morning Friday, October 2nd, 2015 to cut and peel organic vegetables, donated by Veritable Vegetable. 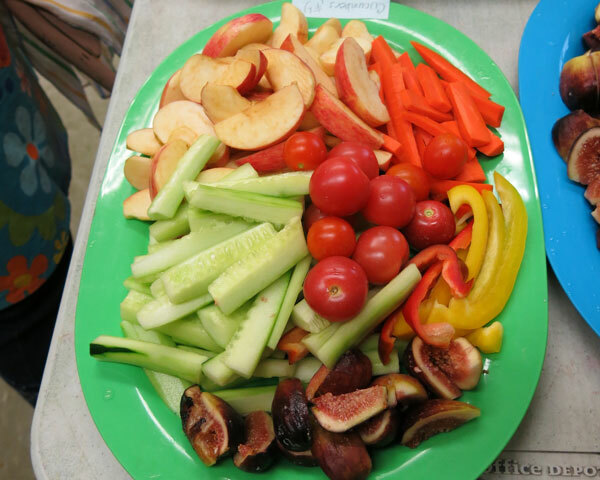 Carrots from Something Good Organics were shaved and HoneyCrisp apples from Cuyama Orchards apples were cored and sliced, and then combined with a spring mix of greens from Jayleaf. 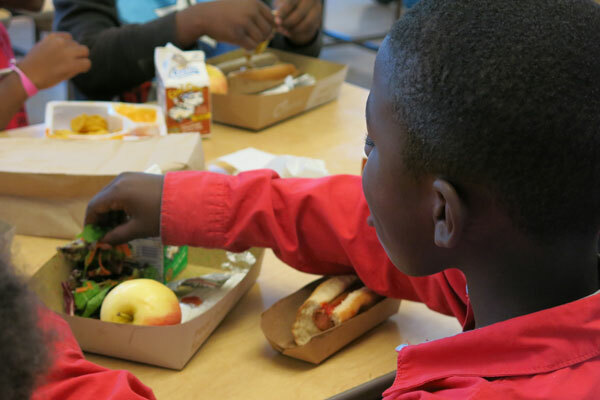 Even though most of us shaved off a little of our fingertips, the morning and lunch were a huge success. 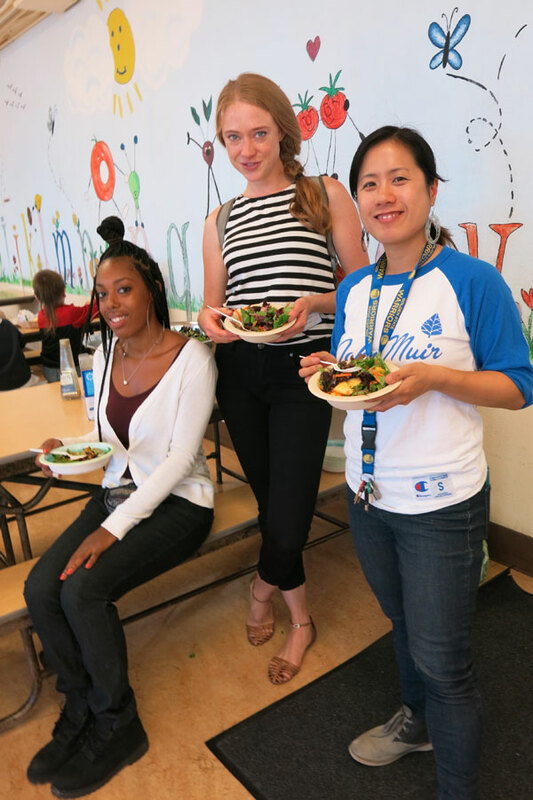 In the cafeteria, waves of students came by to get salads and enjoy seconds. Three big bowls were gone in no time. A delicious party. 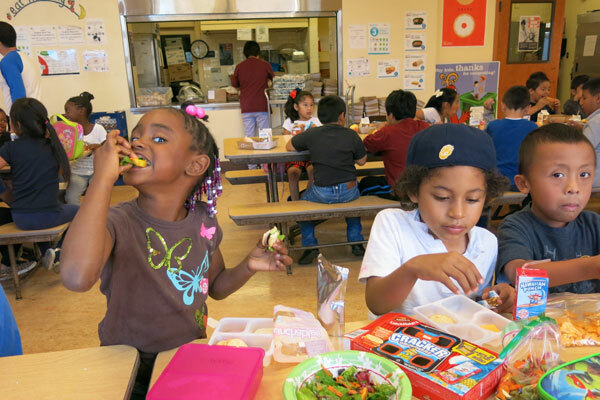 Stay tuned for more salad days at John Muir Elementary School throughout the year. 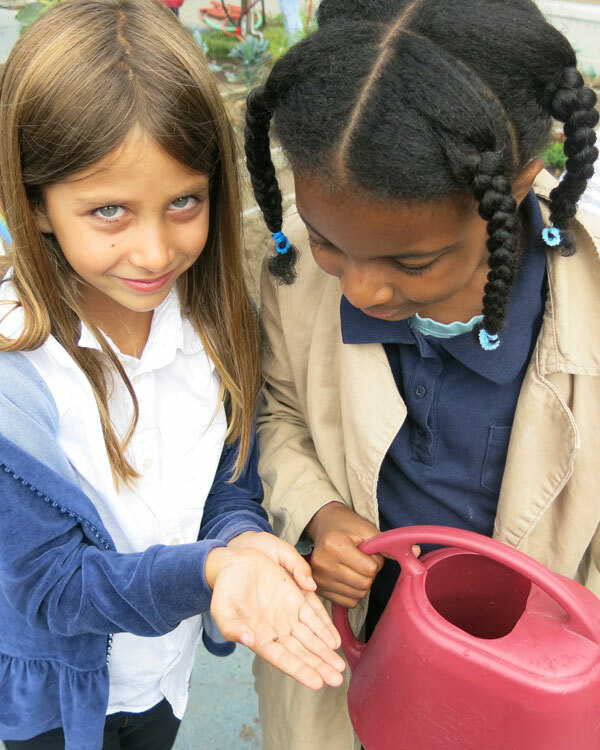 For more photos, check out our CommunityGrows Flickr Photostream here. 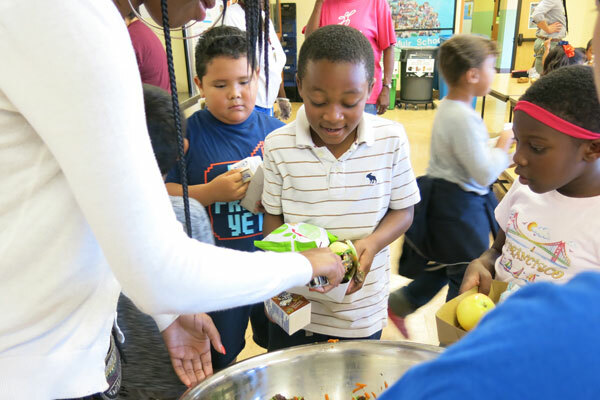 On September 2, 2015 Rosa Parks Elementary kicked off their school year with a planting in the garden and a salad day in the cafeteria. 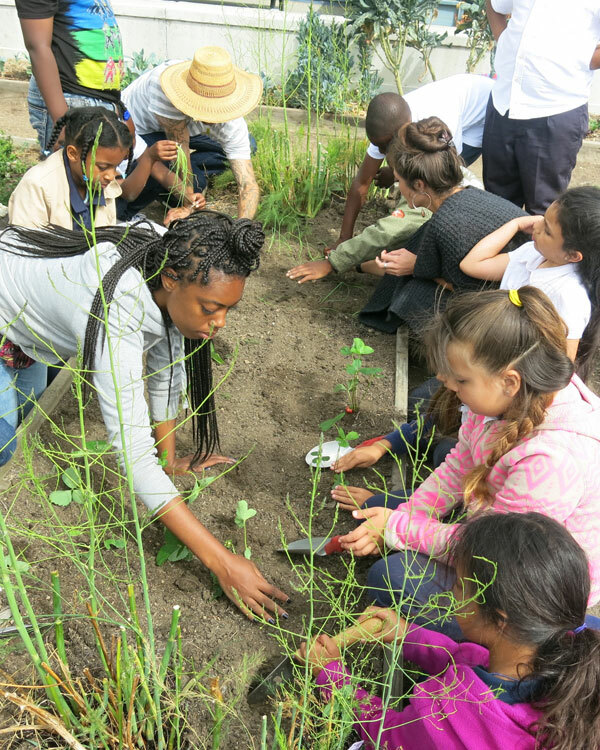 New CommunityGrows Garden Assistant Cha’Shay Woldridge, with the assistance of Garden Program Manager Adrian Almquist, helped Ms. Wong’s class get started weeding and planting in their plot in the lower garden. 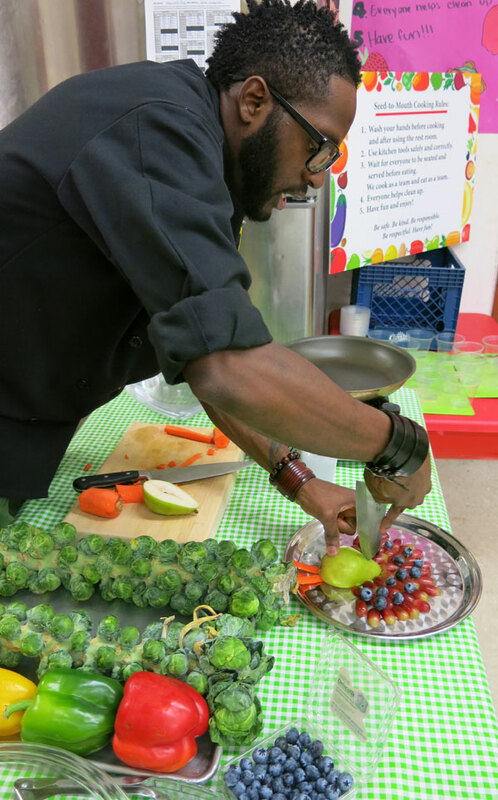 Jay Jordan, our CommunityGrows Garden Educator helped out preparing and serving salad in the cafeteria. 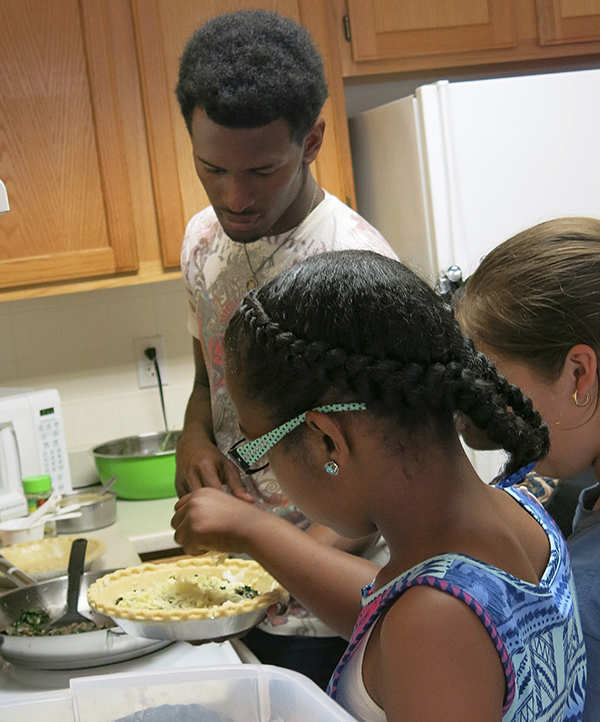 On Thursday, July 23rd, youth from Plaza East put together two beautiful quiches with the help of CommunityGrows staff Adrian Almquist and volunteer, soon-to-be staff, Jay Jordan. 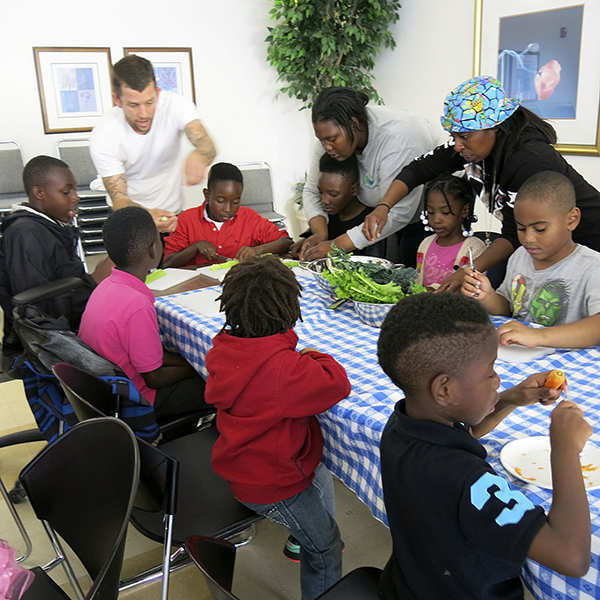 Everyone was excited to work with Jay and pitched in to de-stem kale, chop onions and crack eggs. 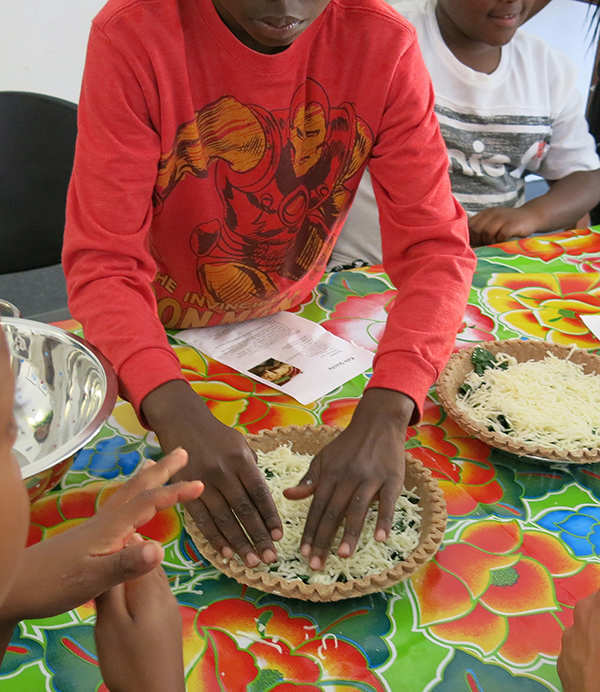 Each youth got a chance to do all the steps of the recipe, and assemble the quiches before they went into the oven. 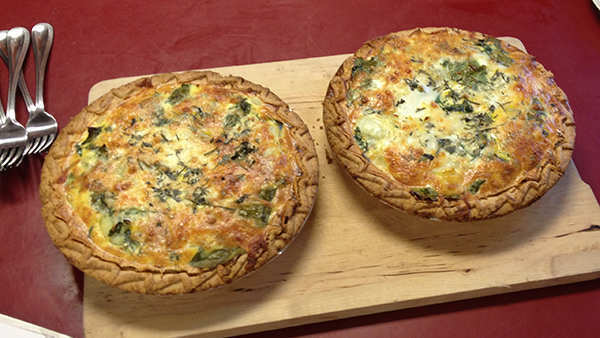 In thirty minutes, the quiche came out of the oven and were enjoyed by all. 2. Over medium-low heat melt butter in a large saucepan. Add onions, garlic and kale. Cook slowly stirring occasionally until the vegetables are soft. 3. 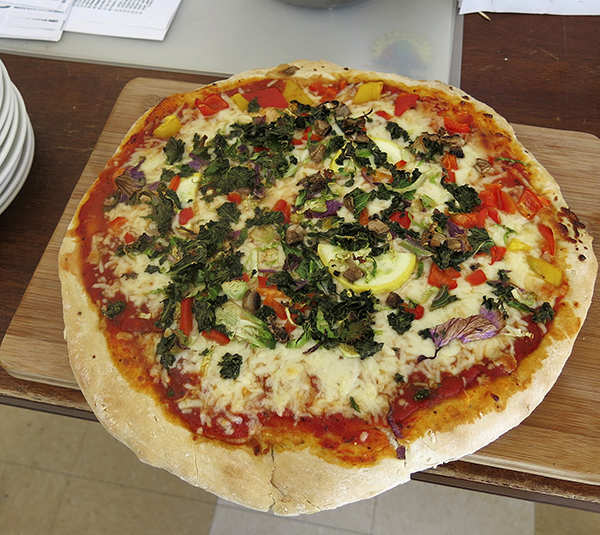 Spoon vegetables into crust and sprinkle with cheese. 4. Combine eggs and milk. Season with salt and pepper and stir in melted butter. Pour egg mixture over vegetables and cheese. 5. Bake in preheated oven for 30 minutes or until center has set. 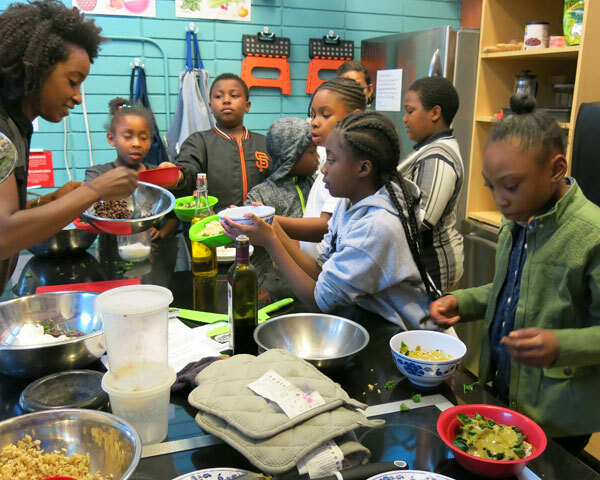 On Thursday evening, June 25, 2015 CommunityGrows held their second cooking event at Plaza East Apartments in San Francisco. 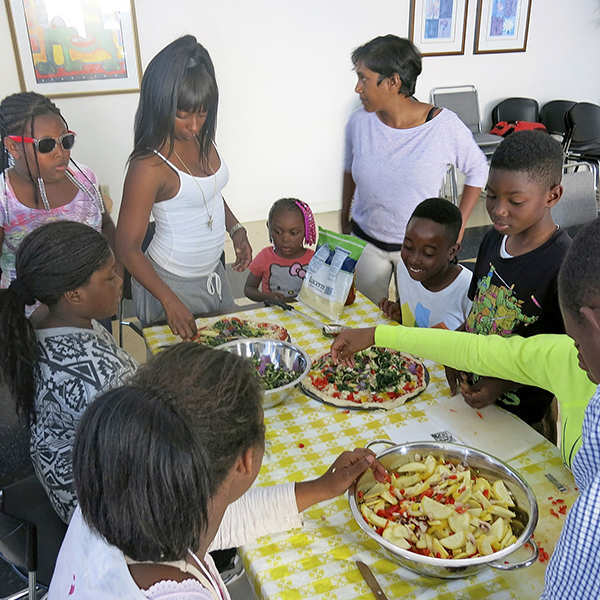 We had a large crowd of youth and families who helped to make delicious pizzas from scratch! 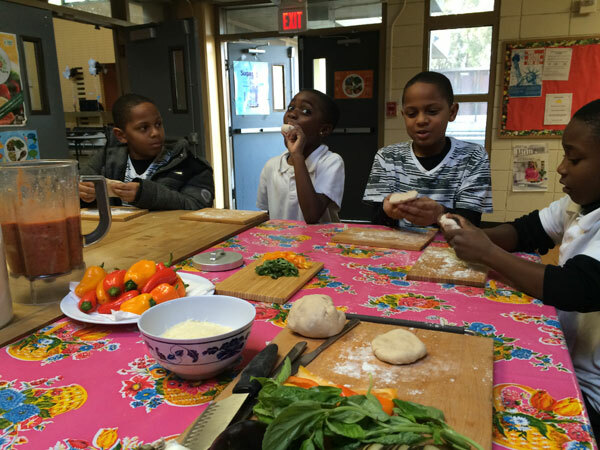 We made our own dough and cut up mushrooms, peppers, and zucchini, and added kale and spinach from the food bank in the area. Here are some great photos from the day. 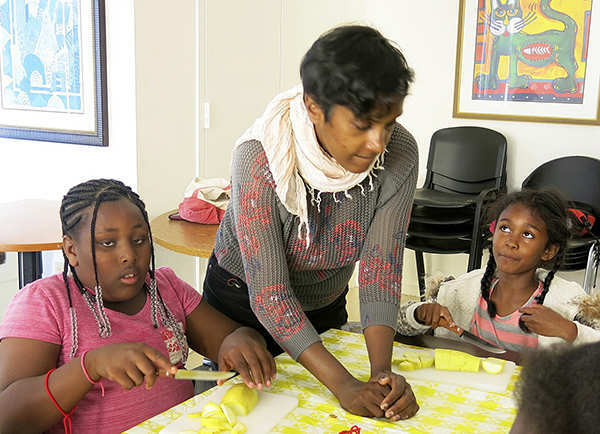 Thank you Ms. Martha Hollins, Shannon Watts and Monica Bhagwan from Leah’s Kitchen for helping out and making the evening a success! 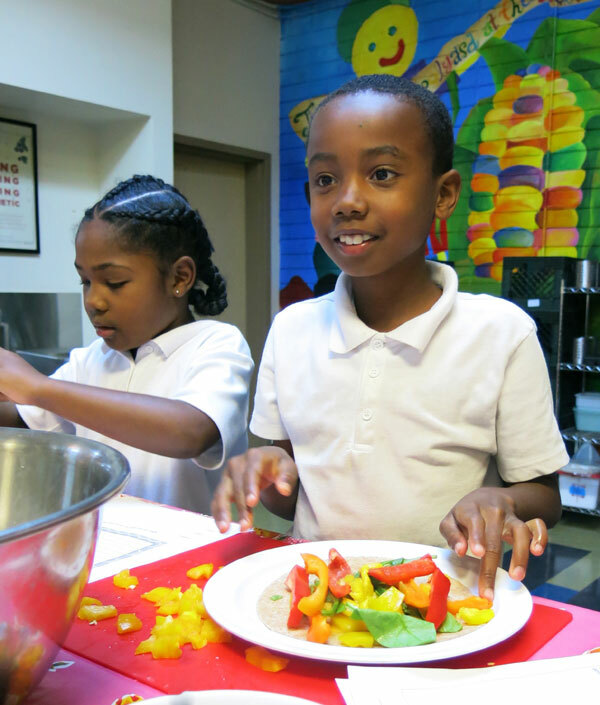 Check out more photos on our CommunityGrows Flickr Photostream here. 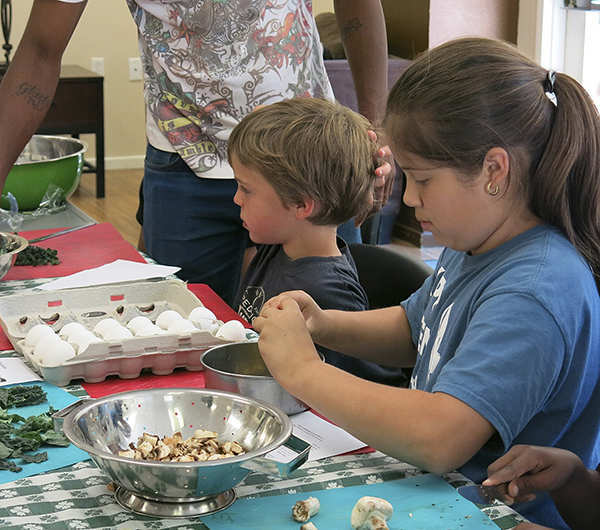 Thanks in part to support from Aetna Foundation and a Community Benefit Grant from Kaiser-Permanente, CommunityGrows held its first of six Seed-to-Mouth cooking classes at Hayes Valley Apartments on Friday June 12, 2015. 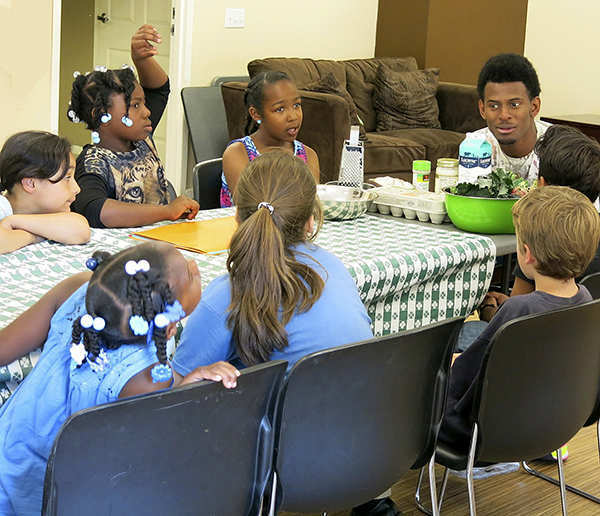 Ziek McCarter, CommunityGrows Garden Assistant led the class of youth from the neighborhood and the Western Addition Beacon Center. Ziek started the class quietly getting to know everyone, finding out how their summer is going, what their garden names are. His garden name is Ziek Zuccini! 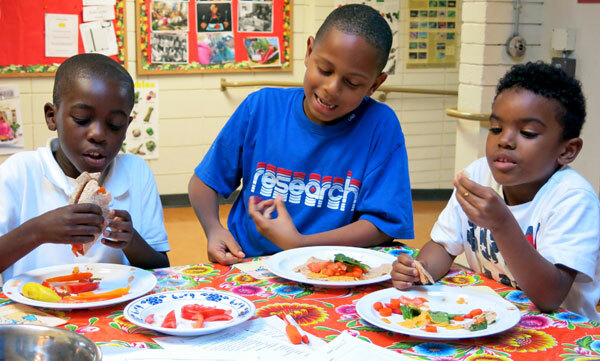 He also asked them what they’d like to cook this summer. 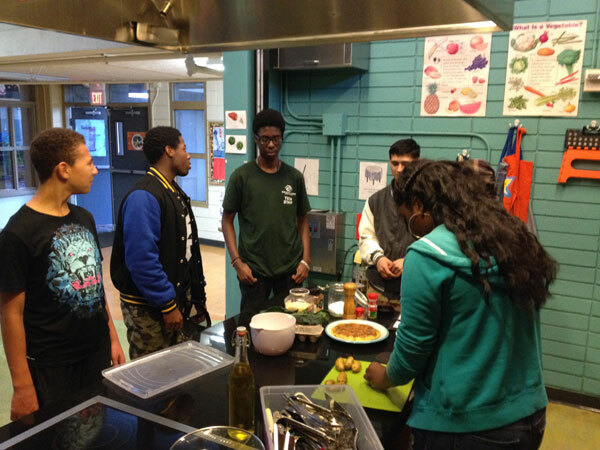 Then the class made quiche. 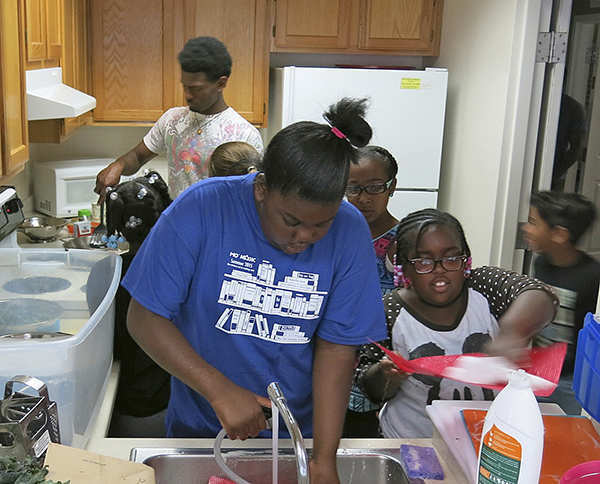 After washing hands, everyone helped chop onions, garlic, and mushrooms, and crack eggs and grate cheese. 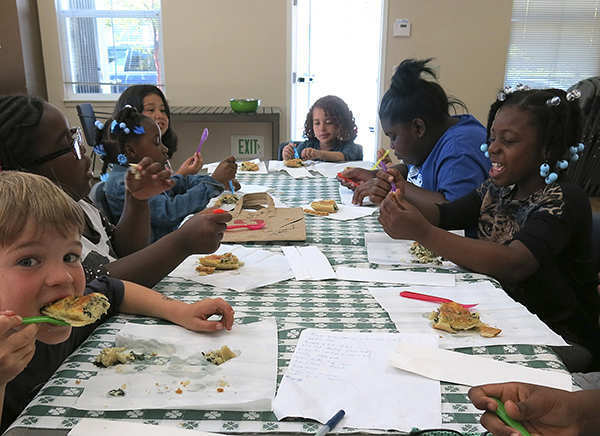 Youth helped clean up and then enjoyed a great slice of pie. A wonderful afternoon with a great bunch of youth. 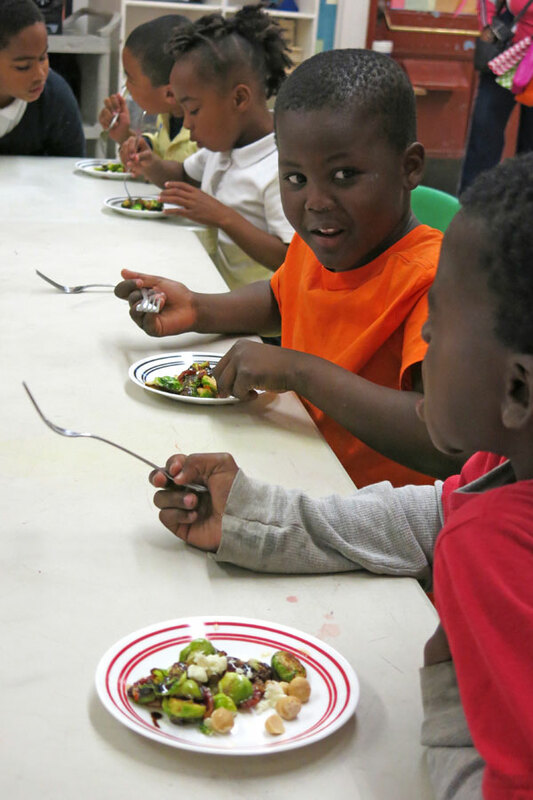 Thank you Ziek Zucchini! For more photos see our Flickr Photostream here. 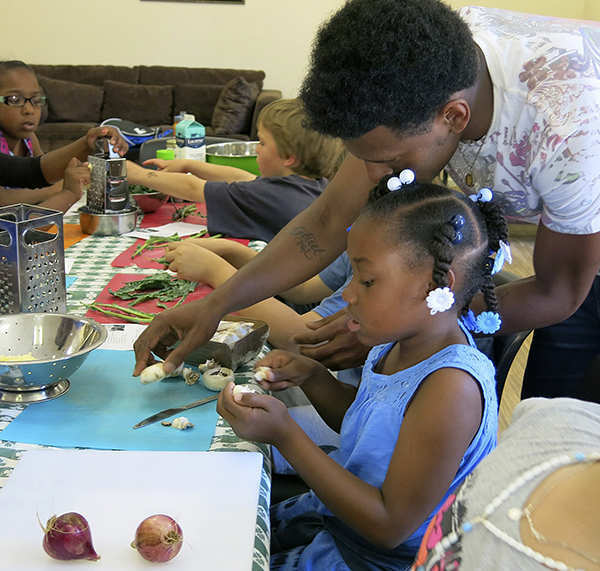 On Thursday evening June 11, 2014, Plaza East Apartments hosted CommunityGrows Seed-to-Mouth Cooking program for resident families and youth. 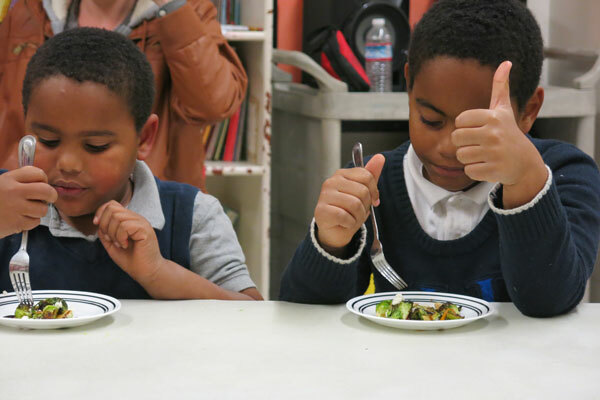 Thanks to a grant from Supervisor London Breed, through the Department of Children, Youth and Families, CommunityGrows is able to offer six nights of cooking from 5:30-7:30 PM through August. The dates are June 11th and 25th, July 9th and 23rd, and August 6th and 20th. 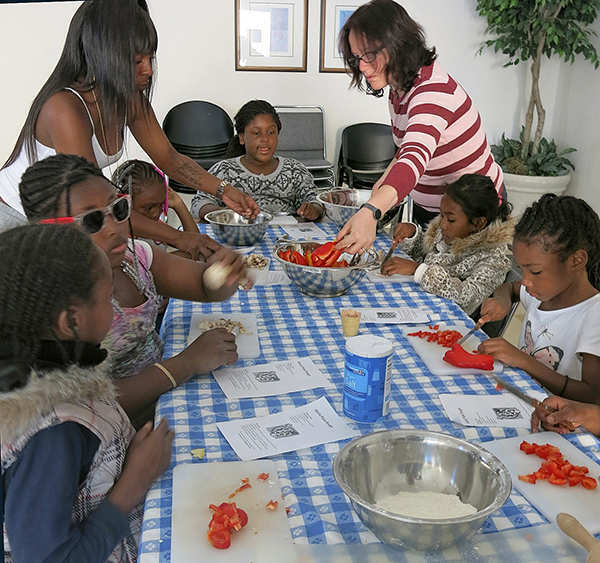 CommunityGrows is doing these classes in partnership with the Buchanan Youth Center at Plaza East, under the leadership of Martha Hollins, Program Coordinator and with the assistance of Monica Bhagwan from Leah’s Pantry. 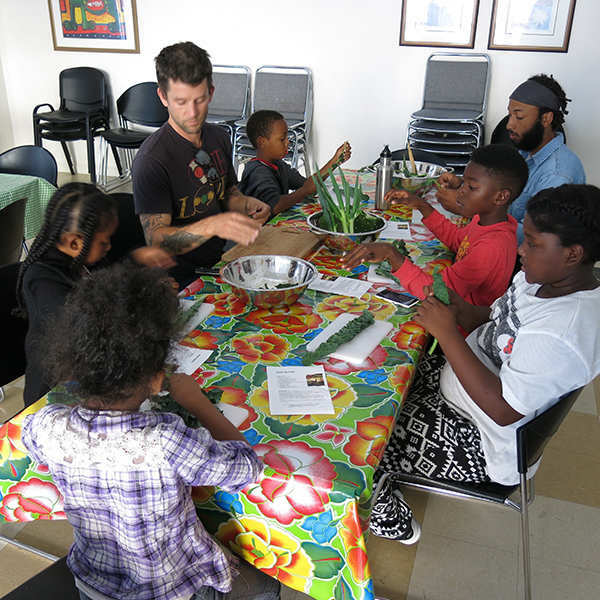 On Thursday June 11th we were honored to Shannon Monique from GreenStreets join our CommunityGrows crew to help lead the class, and assist Adrian Almquist. 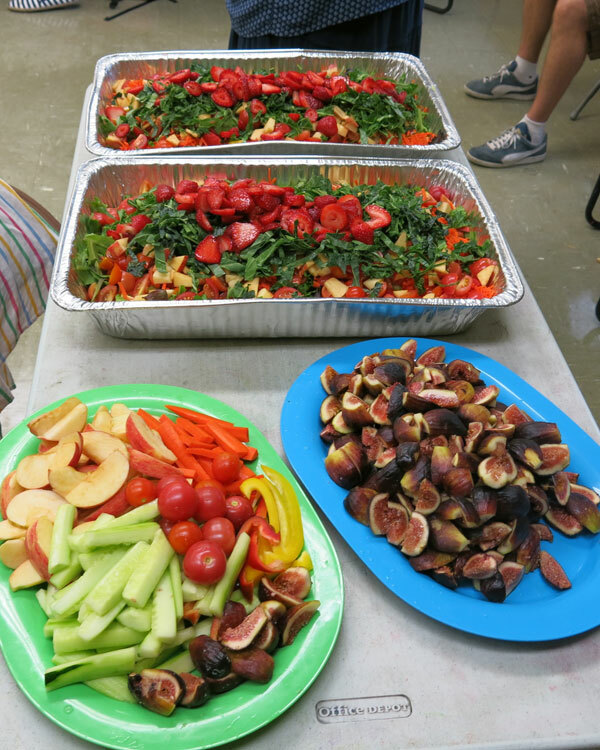 We had over 20 youth and five adults helping to prepare minestrone soup, which we had with fresh baked bread from the oven. It was a delicious dinner and great success for our first time at Plaza East. Thank you everyone for your support and participation! 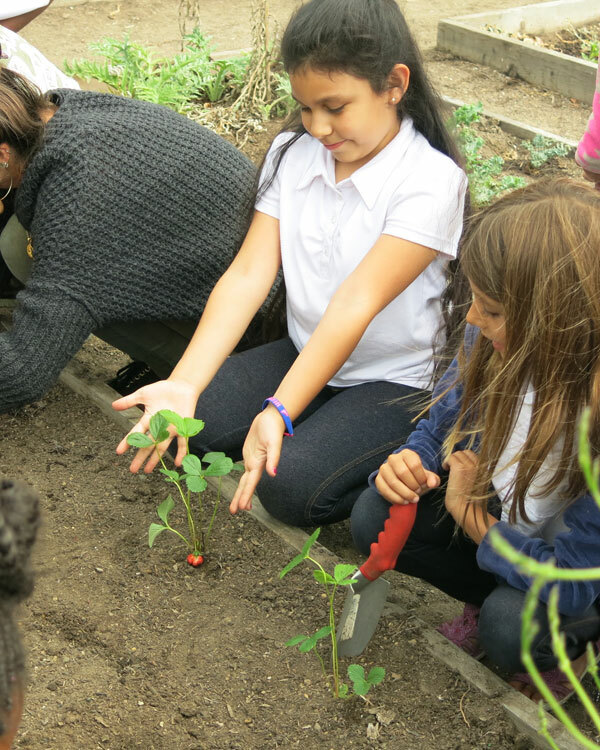 For more photos see our CommunityGrows Flickr Photostream here. Here is the flyer for future reference.